The terminal coming up at New Delhi’s Indira Gandhi International Airport will ensure faster turnaround of business jets and chartered planes, shielding them from the clutter of general passenger terminals, where they now have to compete for landing and take-off slots with commercial planes. “The terminal building is designed to withstand over 60 aircraft movements a day, (and) is being built with a handling capability of over 200 passengers a day..,” said Mark Martin, chief executive officer of Dubai-based Martin Consulting, which is executing the project. The terminal will be able to handle Boeing 767 business jets and any Boeing 777 with a VIP configuration and a passenger capacity of 250, Martin said . About 1,200 scheduled flights operate from Delhi airport every day; an additional 40-50 small non- scheduled chartered planes also land at and take off from the airport daily. Airport official said that VIPs prefer to travel in private jets and all their movements take place from Terminal 1, which is already operating beyond its capacity. According to Martin, site development work on this integrated general and business aviation terminal commenced in March 2018 and work has rapidly progressed on the 22-acre lot that was allocated by the airport run by a consortium led by GMR Group. The facility is expected to consist of 70 plus aircraft parking bays, two aircraft hangars and two fixed-base operators (FBOs) ) to provide aeronautical services; the integrated facility will be capable of handling round-the-clock aircraft movements. “The new business aviation terminal is expected to be up and running ahead of the 2019 elections, subject to development milestones and we’re expecting to have taxi trials by April 1st 2019. The terminal and related infrastructure both are designed to surpass the world standard of 5 square metres per passenger; we plan to maintains the area to passenger ratio in peak operations at 10 square metres per passenger; the highest standard for any FBO in the world,” said Martin. According to airport officials, the apron location is unique as it falls directly on the connecting taxiway Tango, parallel to the new runway 29; this assures faster arrivals and departures for business jets and general aviation aircraft. “The terminal is being designed keeping Delhi’s history in mind and the wall will look like the wall of Red Fort or any other Mughal era structure,” said Martin. According to the aviation regulator Directorate General of Civil Aviation (DGCA), the number of operators with a non-scheduled operator’s permit (NSOP) reached a peak of 147 in financial year 2012, which declined to 111 in 2018. The NSOP fleet in India comprises around 356 aircraft, including helicopters. This is down from a peak of 412 aircraft in financial year 2012. General aviation movements have also remained nearly static over the last nine years, below the 300,000 movements per annum mark. In the financial year 2018, the number declined 6%.High aviation turbine fuel taxes and airport charges, and a shortage of hangars and parking slots were the reasons for the decline. 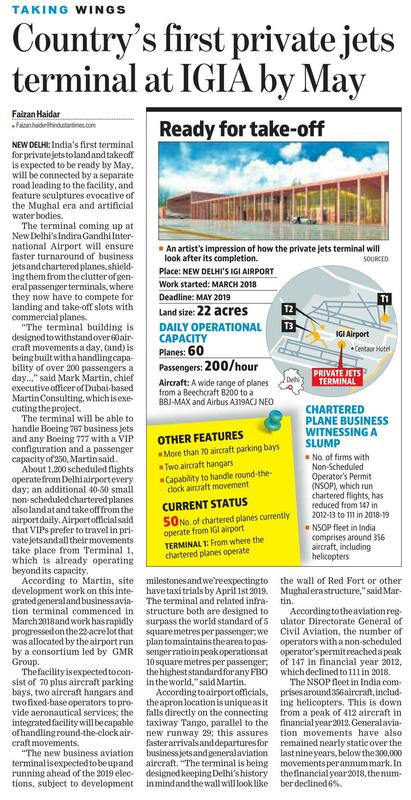 “The separate terminal in Delhi would help us in expanding the business but such terminals are required in other metro cities as well,” said aid Rajesh Bali, managing director of the Business Aircraft Operators Association.